“Girly Edition” is at its best—well, it’s non-Mojo best, at any rate—when it most closely fits into the long Simpsons tradition of skewering the media. Bart’s schmaltzy human interest stories are justifiably the most memorable bit of the episode’s main plot, but threaded throughout the story is a return to one of the show’s favorite stomping grounds, as the episode takes more general aim at the crassness and shallowness of show business. Most obviously, any episode that opens with Krusty smoking a cigar and waxing lyrical about “the tightest three hours and 10 minutes,” complete with Krusty’s nap time and a newly trimmed-down hobo parade, is going to have at least a few worthwhile moments. Springfield’s most lovably lazy phony doesn’t appear beyond that opening scene, but Krusty’s unique brand of non-integrity sets just the right tone for what follows. And he’s got plenty of worthy successors in this story to carry on that legacy of lazy contempt for the audience: Tress MacNeille’s producer character (who would later become Lindsey Naegle, but that didn’t happen until next season’s “They Saved Lisa’s Brain”), Kent Brockman, and Bart himself. What’s particularly fun about the different characters’ attempts at human interest stories—they tug at the heart and fog the mind—is how the episode presents a different kind of crumminess for each one. Kent Brockman’s piece on the carousel is, unsurprisingly, a more professional effort than Bart’s, but there all the little touches that indicate how half-assed Brockman’s work is: He tries to pass off a six-year-old carousel as some Springfield institution—he even uses the word “lo”!—and he calls a clearly non-black horse as “Old Blackie here.” Bart’s segments are even more poorly thought out, as his story on old Joe and his ducks outright reveals that the dude is probably just sitting on the wrong bench. None of this is terribly complicated or subtle—don’t worry, I don’t think I’m some discerning genius for picking up on these details—but laying them out like this is useful in seeing just how those stories work in the context of the episode. The point “Girly Edition” makes again and again is that the specific notes matter so much less than the melody: As long as those pieces are written and delivered in a way that sounds sentimental and poignant, then they are. Even then, there’s an art to doing these things well. “Girly Edition” doesn’t dig deeply into Lisa calling Bart dumb, using it instead as a way to sustain the more general rivalry between the two, but there’s something to infer from Lisa’s utter failure to recapture Bart’s knack for these stories. On some level, if you’re going to treat the audience like a bunch of idiots, then it really helps to be just as much of an idiot as they are. Kent Brockman and Bart are both deeply cynical about what they are doing, and both are obviously just in it for themselves, but they are willing to commit to their own stupidity in a way Lisa isn’t, at least not until it’s time to save Bart from getting killed by a temporarily insane Groundskeeper Willie. What this means then is that Lisa acts all petty and territorial about some silly show that doesn’t matter and that she’s not even all that good at, if her hideously dull top story about periodicals on the chopping block is any indication. I point all this out because it feels like there’s a running gag here just simmering below the surface, as Lisa repeatedly declares the importance of a news show for kids and never quite has it pointed out to her how ludicrous a sentiment that is. Sure, the proto-Lindsey Naegle is upfront about how Bart has a talent Lisa doesn’t, showering her with nonsense showbiz lingo like zing, zork, and kapowza. (Actually, on second look, she never said “zork.” Our mistake.) And, of course, there’s the now expected Simpsons twist at the end, where the very second Lisa and Bart agree to combine their talents and work together, Kidz Newz is unceremoniously canceled. If there’s an issue with “Girly Edition,” it’s that the main story is just a trace too insular. Once Bart meets with Kent Brockman and starts making his puff pieces, his internal crisis about being dumb ends, and he reverts to being just a thorn in Lisa’s side, with no further development of his perspective. As ever, it’s not fair to judge an episode on what it doesn’t do, but past episodes have shown it’s possible to develop multiple main characters’ perspectives, even if one is clearly secondary. 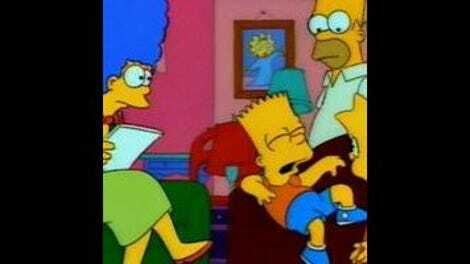 (For a similar kind of dynamic between Lisa and Bart, you could look at something like “Summer Of 4 Ft. 2,” where the focus is heavily on Lisa, yet the episode takes just enough time to develop a consistent motivation for Bart’s jerkish behavior toward her. But then that episode is probably my second favorite episode of the entire run, so maybe that’s not a fair comparison.) Here, the main story flips between Lisa raging against what she perceives as an unfair world and Bart briefly proving a point to himself, then back to Lisa again. Their rivalry here might have been more compelling if Bart had still yearned for Lisa’s approval, even after everyone else showered him with praise. But hey, that’s a different episode than the one that, you know, exists, and the actual “Girly Edition” works well even with an underdeveloped emotional core. 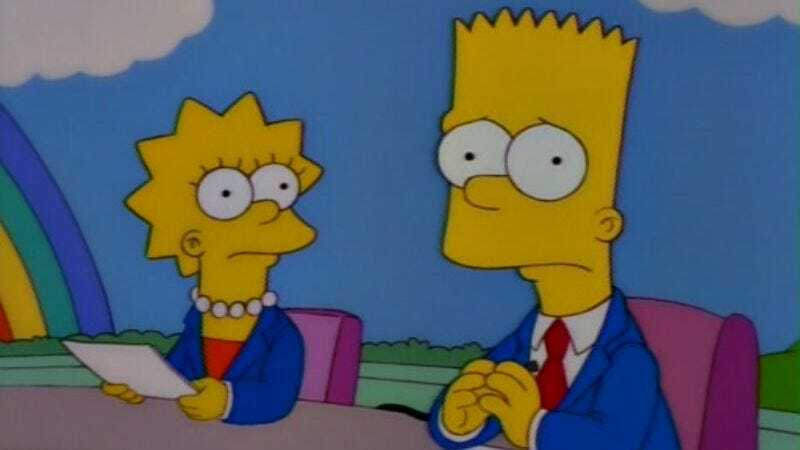 The parody of news shows and puff pieces remains on point throughout, both with Bart’s idiotic yet affecting schmaltz and with Lisa’s hilariously failed efforts to do the same with the cat lady and the surprisingly well-utilized train tracks. And, of course, there’s Homer and Mojo. I’m not sure this even really counts as a full-on subplot, since it’s basically just Homer hanging out with and slowly ruining a monkey. Which is to say, it’s pretty much the perfect runner, with Homer’s time with Mojo bookended by Grandpa licking his lips in anticipation of eating the monkey and by the famous, computer-aided line: “Pray for Mojo.” What happens in between is just a ton of dumb fun, as only something pairing Homer and a monkey could hope to be, though special credit needs to be given to the animators, particularly No Doubt’s Eric Stefani, who returned to his old job as an animator specifically to help get Mojo’s movements right. As ridiculous as much of Mojo’s antics are—and by “antics,” I do mean “horrible things Homer makes Mojo do”—he never comes across like a cartoon monkey, and that sense of realism is part of what sells the general silly fun of that part of the episode. “Girly Edition” is a solid episode, and it’s really hard to argue too hard with the charms of an episode that gives us both Mojo and old Joe and his ducks. As a parody of news shows, it’s so close to the real thing as to almost not be parody at all. This isn’t the first episode this year where it’s possible to see how this could have been better, particularly in how the show develops its main characters. But there’s still plenty of room for solid laughs and satire even when an episode falls short of greatness, and that’s where “Girly Edition” comfortably resides. I’ll also say that, as far as Fox animated shows doing episodes about student newscasts, I do prefer the Bob’s Burgers entry “Broadcast Wagstaff School News,” which presents a much more plausible version of kids running their own news show, and tends to be more clued in to what kids find fascinating. Poop, mostly.